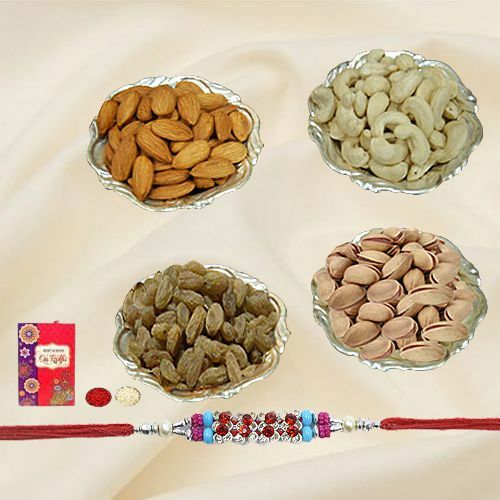 Dedicate your prayers for the good fortune of your dear ones and deck it in the presence of this Auspicious Festive Rakhi with Fruits and Nuts complemented with a free Rakhi, Roli Tilak and Chawal on Raksha Bandhan. Greet your dear brother with 4 Silver plated Bowls loaded with mixed Dry Fruits of 500 gms. like Apricots, Raisin, Cashew and Almond and spread the happiness into their lives.